Quality and customer satisfaction are our #1 priority at JLMC. We are working up to an ISO 9001:2015 certification and we implement and abide by our Quality Management System (QMS) as outlined in our QMS Manual. 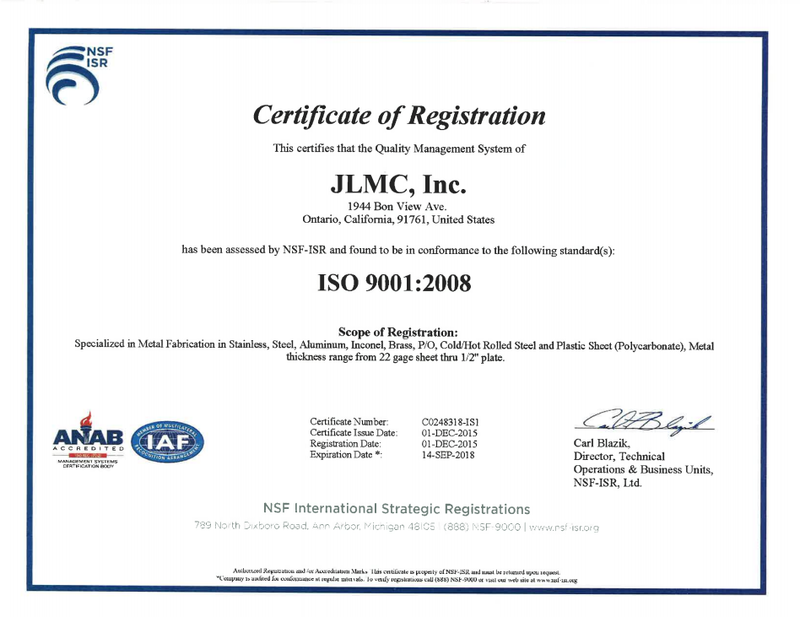 Our QMS body of ISO-level procedures, forms and Quality Records provide information, guidance, and the rigorous quality control procedures established by JLMC to meet and/or exceed ISO-level requirements. To download this certificate, please click here. The procedures in our QMS manual and database are specifically written and implemented to comply with the letter and intent of all regulations and requirements as set forth in MIL-I-45208A and ISO 9000:2001. Note that we can also meet your AS 9100-level specifications as needed. Our QMS manual describes the manner in which our inspections and quality control procedures are practiced, and outlines our company policy for maintaining an effective and efficient quality assurance program. Our Quality Management System manual (JLMC-QMSOP-15-001) is available anytime upon request. Give us a call at 909-947-2980 or fill out our contact form, and we will have a sales rep contact you within 24 hours.